IS WARREN BUFFETT LOSING IT ? His money, not his marbles ! 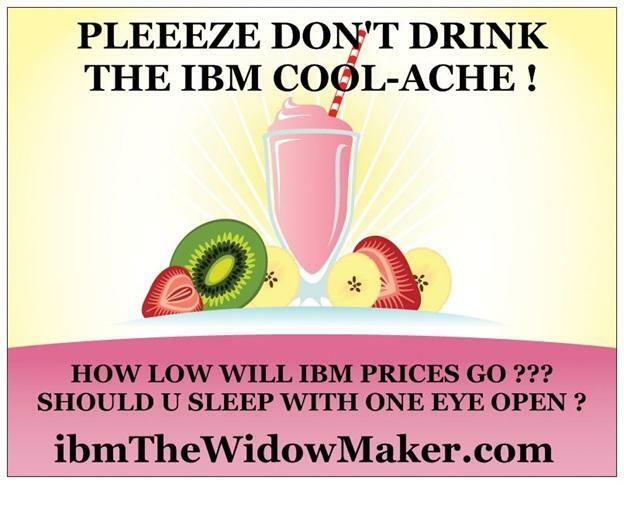 Is Warren Buffett sipping the IBM Cool-Ache ??? IBM PRISON POETRY & A FABLE: MADOFF MOVE OVER ! Warren Buffett just plunked down nearly $11,000,000,000 into IBM stock while IBM's outgoing CEO, incoming CEO, CLO, CFO, and other IBM Big Execs blessed the IRS by discreetly selling their IBM shares in a manner not to alarm the market. The SEC and DOJ should want to meet and greet their Wizard Financial Advisor ! tremble in their boots ? Could it possibly be the October 29, 2012 IBM PONZI RICO trial ?? ?